Drag the misplaced pieces of the picture to where you think they belong. Your browser does not support the Java Plugin. Please check your browser and ensure that the Java plug-in is installed and is enabled. Clouds are the sky's way of moving water from one place to another. Water on land or in the ocean evaporates, turning from a liquid to a gas called water vapor. The water vapor rises, cools, and then turns back into a liquid, forming tiny droplets. Enough of these droplets make a cloud. When the droplets come together, they combine to form bigger droplets. When they get big enough, they fall to the ground as rain. Or, if it's very cold, they freeze and come down as snow or sleet or hail. Meanwhile, the wind may have blown the cloud a long distance from where its water started. You can tell a lot from a cloud's shape, size, and "texture." We put clouds into categories based on their shape, how high they are in the sky, how big they are, how they formed, how fast and in what direction they're moving . . . and so on. Sometimes clouds are very unruly. They appear to be a little of this and a little of that. Why should we learn about clouds? Besides moving water around from one place to another, clouds play a very important part in maintaining Earth's temperature. Scientists need to understand better how clouds affect climate. Current weather satellites give scientists a lot of important information about clouds, but they don't show anything about how the clouds are built top to bottom. 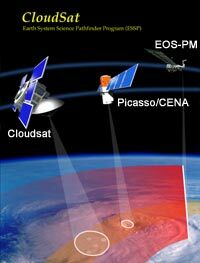 Cloudsat is a space mission to study clouds, taking 3-D images of them using advanced radar technology. It was launched April 28, 2006. Cloudsat is orbiting Earth, flying in formation with two other satellites that take cloud measurements using different kinds of instruments. Cloudsat measures how much liquid water and ice are in the clouds at what heights, and how these factors affect the clouds' ability to reflect or trap the sun's energy. Data collected by all three satellites is combined to give a better understanding than we have ever had before of how clouds work and how they affect climate all over Earth.